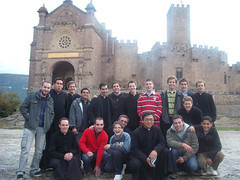 Saturday, the 30th of October: A group of boys and Servant Brothers of the Home of the Mother met up for a weekend retreat. The day began with exposition of the Blessed Sacrament. We left Urroz, a small town close to Pamplona, to go to Torreciudad, where we visited the shrine built in honor of the miraculous cure of St. Josemaria Escriva when he was very young. After admiring the beautiful sanctuary and praying before the Blessed Sacrament, we ate sandwiches beneath the shade of some pine trees. At four o´clock, we arrived at Barbastro. There we listened to the story of the seminarian martyrs, killed during the civil war for professing their Catholic faith. Their joy and love of Jesus Christ impressed us all. The martyrs left their testimonies on things as varied as handkerchiefs and chocolate wrappers… whatever they had available. 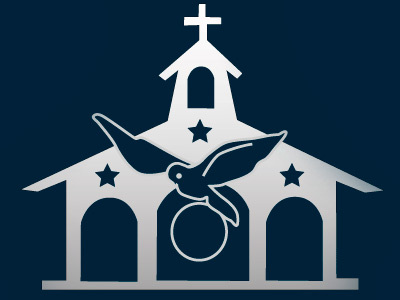 Before their transparent caskets, looking at their bones, we prayed that Our Lord might strengthen our faith. Just above their caskets, we participated in the holy Mass celebrated by Fr. Juan, using a chalice used by the martyrs. During Communion, we sang ´´Blood of Christ, inebriate me…`` that the Lord might grant us the same mad love of the martyrs for Jesus. Sunday, the 31st of October: We began the day with exposition of the Blessed Sacrament and points of meditation given by Fr. Juan about the importance of true prayer in our lives. We played soccer in the morning, giving glory and honor to God with our body and having fun at the same time. We walked a little ways to the parish of Urroz to participate in the Holy Mass. 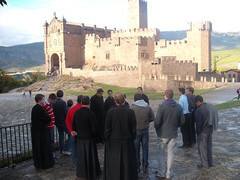 We all ate together and then left for Javier, to visit the family castle of St. Francis Xavier. We saw the baptismal font where he received the life of grace in his soul and there we prayed that the Lord might strengthen our faith. We played soccer and American football on the same land where certainly centuries before the feet of young St. Francis would have stepped while he played. It is very probable that he smiled upon us from heaven. 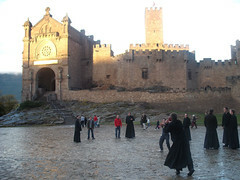 We were quite a spectacle for many of the visitors… so many men in cassocks playing soccer with kids. Later, we watched a movie called Fire Proof about a marriage that seemed as if it would hopelessly end in divorce. However, through painful efforts and the discovery of the need of Jesus Christ and His grace, the man fought to save his marriage. Many values were clearly shown in this film. We ate together in an environment of joy and laughter. There were also some boys from the town who were having such a good time that they did not want to leave, on a night when many people of the town were foolishly taking part in the celebration of Holloween.